Lesley Lane. Five Little Monkeys. 2010.
oil on canvas. 12 x 15.5 in. 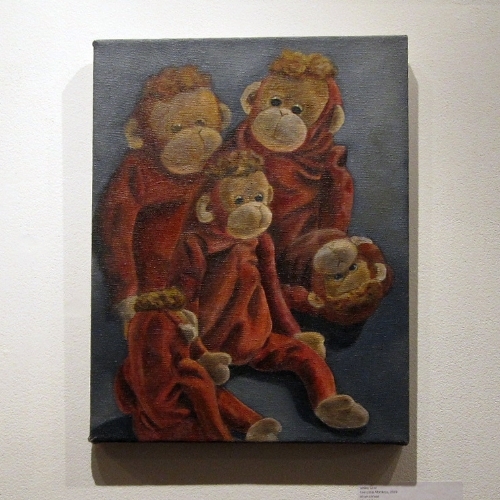 Through the artwork entitled Five Little Monkeys, Lesley Lane has explored human psychological states as attributed to inanimate objects. This piece was an experiment with the indirect method of oil painting. It is a reflection of Lesley’s interest in emotions. Her current body of work deals with self-perception and confronting physical insecurities. This piece shows the move toward these themes by observing different angles of the subject. Lesley is also interested in representing humorous and absurd items in her work. Monkeys carry an element of playfulness, alluding to various amusing characters and stories.